A highly desired performance car, the M4 rental is a great option if you seek a fun car to rent in Miami, NYC, LA, Boston, or Vegas. The M4 is a beautiful sports car to rent and will surely make your vacation or business trip memorable. A convertible M4 allows you to experience the outdoors while traveling in the comfort of a BMW rental. The awesome thing about the M4 convertible hard top is that you can raise and lower it with the touch of a button and transform it from a convertible to a coupe in seconds. Rent a BMW M4 today in your favorite city today and you won’t regret it. Don’t hesitate in calling us, the car of your dreams is now available for rent in your city today! The powerful twin-turbo inline-six cylinder engine is one of its most coveted by auto enthusiasts around the world. The engine combined with the 7-speed dual-clutch transmission comes with paddle shifters providing quick shifts. A finely tuned suspension helps keep the M4 agile around all the curves and the aerodynamics help keep the tires glued to the pavement. On the M4, the rear-axel subframe is attached with mounts directly to the car creating one of the best handling cars in its class. Although the ride is very firm it helps to give it more of a race car feel while slightly compromising comfort. Carbon Fiber Reinforced Plastic (CFRP) is found on several components such as the trunk lid keeping the footprint light and the weight down. 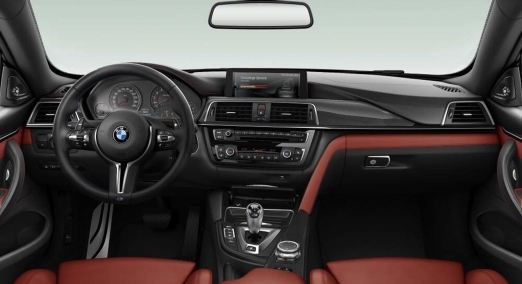 The interior of any M4 rental looks like it was deloped for a racing car. Starting with the beautiful bucket seats which hug your body on all those curvy roads. They also come with a 10-way power adjustment to get the perfect fit for your body type. The M4 is not as extreme as some of the other exotic car rentals such as the i8 but provide more subtle styling. This is not the car that shows off its muscles outside but rather the car that has a big surprise if you mess with it. The small details such as the M colored stitching on the steering wheel and M badges let you know that you’re driving a uniquely powerful exotic sports car. 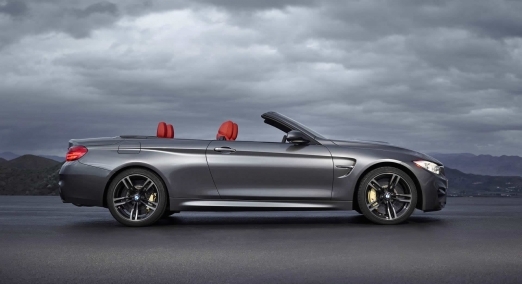 The cost to rent a BMW M4 varies from city to city. The average price per day, however, is $495 and can range on the time of the year. During special events, the cost can also go up. The M4 requires a security deposit of $2,500-$5,000. At Luxury Car Rental USA we provide BMW M4 rentals for a day, weekend or weekly. Delivery is also free in some cities we can have this beautiful BMW rental delivered to your hotel, home, business or to the Airport. We would love to help you surprise your family member or significant other with a BMW Rental for their birthday, prom, wedding, or just because. We also provide weekly discounts if you’re renting for an extended period of time.